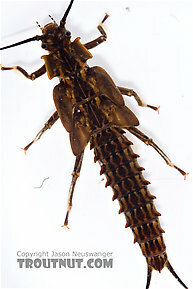 This genus contains the largest stoneflies, and probably the most important thanks to the species Pteronarcys californica. It is commonly called the Salmonfly, and is responsible for the famous hatches of giant stoneflies across the West in the summer. Pteronarcys princeps complements it in higher altitudes across its range. 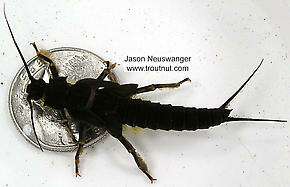 Pteronarcys dorsata or Giant Black Stone as it is often called is an eastern species which occasionally provides angling action, but it is nocturnal and its populations cannot compare with californica. 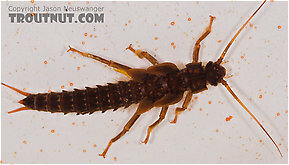 In most angling literature, species of this genus were referred to as Salmonflies in the West and Giant Black Stoneflies/Stone Creepers in the East. Over time these regional names are going by the wayside as more and more anglers refer to all of them collectively as Salmonflies. Read about each species for details. Are stoneflies and salmonflies the same thing or are they just related because here in the mid west we have the stonfly hatch and if they are related the stonfly could be called the salmonfly and the salmonfly hatch is only in the west because I have trouble because I want to become a better insect identifier when it comes to fishing because i went to other sites that so a stonefly is a stonefly and a salmonfly is a salmon fly but yet you say stonefly nymph but in parenteseses you have american salmonfly so is there really no such thing as a salmonfly but it is rather called a stonefly.